A quote from Marcus Nordlund – about jealousy in `Othello’ from a chapter in `Evolution, Literature, Film: A Reader’ (2010) and some thoughts on `Primer’ (2002). A quote from Marcus Nordlund – about jealousy in `Othello’ from a chapter in Evolution, Literature, Film: A Reader (2010) and some thoughts on the (amazing) top 20 RoI movie, Primer (2002). When we turn to the literary text [Othello], I hope to show that a combination of the biocultural perspective on human nature with some hermeneutical awareness can serve as a strong corrective to excessive literary reductionism (either biological, cultural, or otherwise). Since claustration practices have developed independently among humans on all five continents, and still survive in parts of the Islamic world, it would appear that humans have not been averse to such tactics either. [Othello’s] basic problem is… that he has been sufficiently attractive enough to attract a very attractive woman who is likely to attract a substantial number of very attractive men. But let us pause right here, just before we raise the biocultural flag and proceed to celebrate Shakespeare as the world’s first literary exponent of gene-culture interactionism. 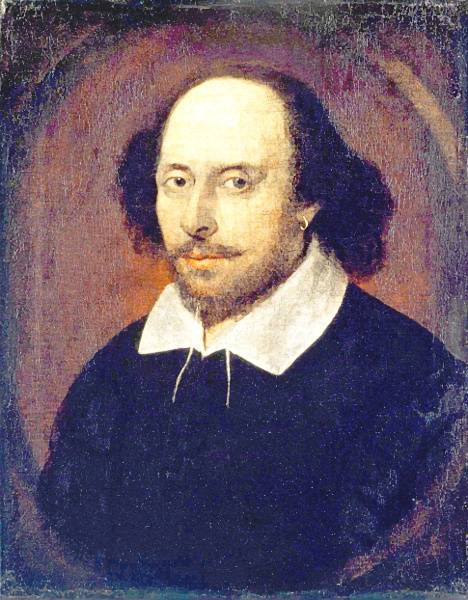 For the question remains whether this string of psychological causes – for all its textual and theoretical support – can really be regarded as a sufficient cause for the singularly violent and destructive jealousies that Shakespeare depicts. Is it convincing to suppose that most powerful men who marry beautiful women whom they love deeply will sooner or later turn jealous to the point of murder? But what Shakespeare treats us to in Othello and The Winter’s Tale is not everyday jealousy or a stage version of the average Elizabethan man. He confronts us with the horrifying individual exception rather than the psychological rule. The scary and interesting thing about Shakespearean jealousy, then, is that its deepest mystery cannot be explained away. We cannot assign it to a barbaric and unenlightened past, to a pathological insecurity that can be eradicated by equal doses of therapy and social change, or to some hard-wired mate-killing module. Othello is a `Villain Triumphant’ story. (The good guys don’t win.) Othello, in his prolonged fit of jealous rage smothers Desdemona for (believed) adultery – and stabs himself to death. In terms of cause-and-effect, this was all caused by Iago deciding to get revenge on Othello, for promoting Cassio above him. So – in Nettle’s terms, it’s a `status game’ for Iago, and also, a revenge story. (Iago getting his revenge.) In another way, about (1) Survival, (2) Reproduction and (3) Revenge. What Othello also illuminates is: Just how complex human nature and human behaviour can be given certain circumstances. Everyone assumes they know `what is going on in the world’, operating on – and making decisions using – the best information they have, at the time. Sometimes – this information is wrong. But human nature includes jealousy, and as Nordlund indicates, probability affects almost everything – If you marry an extremely attractive woman (and therefore feel a little – or a lot – insecure) your mind can play tricks on you, and stuff can `eat away at you’ and it certainly doesn’t help if some spiteful a-hole called Iago is whispering a load of lies in your ear…! Michel Ciment: You are an innovator, but at the same time you are very conscious of tradition. Kubrick: I try to be, anyway. I think that one of the problems with twentieth-century art is its preoccupation with subjectivity and originality at the expense of everything else. This has been especially true in painting and music. Though initially stimulating, this soon impeded the full development of any particular style, and rewarded uninteresting and sterile originality. At the same time, it is very sad to say, films have had the opposite problem — they have consistently tried to formalize and repeat success, and they have clung to a form and style introduced in their infancy. The sure thing is what everyone wants, and originality is not a nice word in this context. This is true despite the repeated example that nothing is as dangerous as a sure thing. Nordlund’s analysis of Othello also puts me in mind of the top 20 RoI film, Primer. (Notably – one of the findings of StoryAlity Theory is that all top 20 RoI film key creators were writer-hyphenates, as, they not only wrote – but also had another role on the film… eg Director, or Actor, or Producer, etc. Certainly all of the above 5 reasons can obviously apply to many instances of real-world violence. That is to say – some people kill for religious reasons; some for reasons of unjust economic exploitation; some for emotional and psychological frustration reasons (see: Othello); some kill due to genetic factors (e.g. say,serial killers, psychopaths and sociopaths – who are perhaps born with a brain-chemistry that means they don’t have enough empathy or conscience), and of course – `man – the killer ape’ – or, the fact that we are still a primate with certain evolved instincts that can be (though are not necessarily always) triggered in certain highly unusual circumstances. There are also clearly many more reasons why people kill – but Kubrick has certainly listed out 5 of the frequently-occurring ones. Sometimes it’s biology, sometimes it’s culture (e.g. religion), and sometimes both, and sometimes neither – but can be random chance. 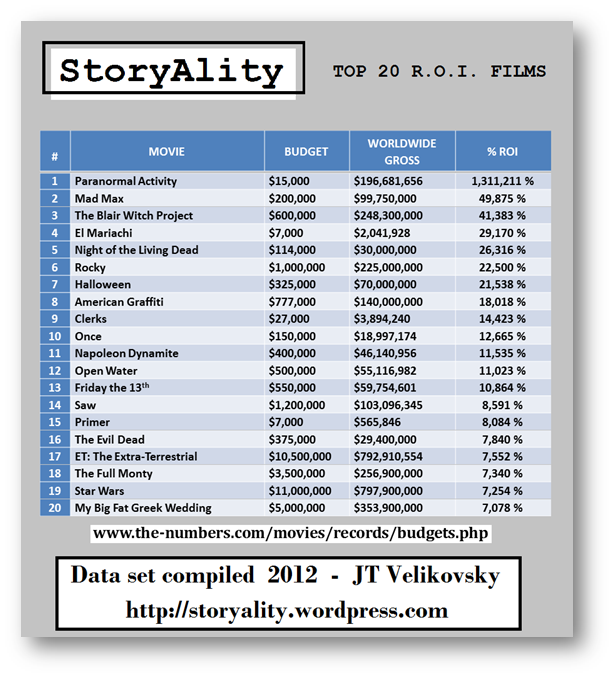 Interestingly, 10 of the Top 20 RoI Films are `about’ killing. (Paranormal Activity, Mad Max, The Blair Witch Project, El Mariachi, Night of the Living Dead, Halloween, Friday the 13th, Open Water, SAW, The Devil Inside). Human nature is sometimes a fascinating mystery because – in specific cases, each person has a unique environment and heredity – and, due to agency and structure, and unique life experience, the circumstances that they find themselves in can vary, wildly. – When people are stressed, strung-out and tired they can often react in irrational ways. Overall there are still certain generalized Human Universals, but also – given the amount of variables in life, who the hell can really say (or, predict) what anyone will do, in any given situation…? There are only probabilities, and those depend on what we actually know for certain at the time, about the circumstances. `Once the fictitious world is set up, the protagonist is given a goal and we watch as he or she pursues it in the face of obstacles. It is no coincidence that this standard definition of plot is identical to the definition of intelligence that I suggested in a previous chapter. Characters in a fictitious world do exactly what our intelligence allows us to do in the real world. We watch what happens to them and mentally take notes on the outcomes of the strategies and tactics they use in pursuing their goals (Carroll Evolution; Hobbs Literature). What are those goals? A Darwinian would say that ultimately organisms have only two: to survive and reproduce. And those are precisely the goals that drive the human organisms in fiction. Fiction is especially compelling when the obstacles to the protagonist’s goals are other people in pursuit of incompatible goals. – In my own view, given entropy, chance, randomness and chaos theory, it is a miracle that anything ever actually works… Let alone, feature films getting made, and then – being good, let alone great… (Or: super-viral, like all the top 20 RoI films)… In making a feature film, there are so many things that need to `go right’. 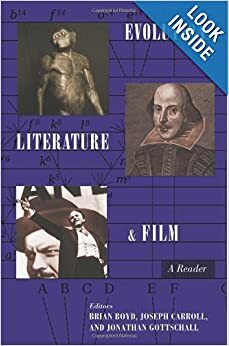 Also, for a summary of Polti’s `36 Dramatic Plots/Situations’ (derived from Gozzi), see also my book The Feature Screenwriters Workbook – which summarizes around 100 film story/screenwriting textbooks. Castle, A. (2005). The Stanley Kubrick Archives. Köln; London: Taschen. Marcus Nordlund, reprinted in Boyd, B., Carroll, J., & Gottschall, J. (2010). Evolution, Literature and Film: A Reader. New York: Columbia University Press. Steven Pinker, reprinted in Boyd, B., Carroll, J., & Gottschall, J. (2010). Evolution, Literature and Film: A Reader. New York: Columbia University Press.